Good morning. I attach great importance to this speech. I began to prepare it almost a year ago. I want to let you know the domestic and foreign policies of China, the most populous country in the world, particularly its policies toward ASEAN. We in China know full well that only innovation can ensure the continuous progress of a nation, only openness and inclusiveness can bring prosperity to a nation, and only commitment to the path of peaceful development can enable us to achieve the goal of building a strong, democratic, harmonious and culturally advanced modern country. I am being truthful in introducing some basic views concerning China's domestic and foreign policies. Every sentence of mine is truthful, because only truthfulness can move people. I believe I can give a good speech, which will not let you down. It gives me great pleasure to visit Indonesia, the beautiful country of thousand islands. I want to thank the Indonesian Council on World Affairs for its kindness in arranging this event. Let me first of all extend, on behalf of the Chinese people, warm greetings to the people of Indonesia, and sincere thanks to friends from all sectors who have long been committed to the friendship between our two countries. Indonesia is a big developing country full of vigor and promise. Over the past few years, under the leadership of President Susilo Bambang Yudhoyono, the Indonesian people have engaged in a tremendous endeavor to develop their country. They emerged from the natural disasters stronger and tackled the international financial crisis with effective measures. I see in Indonesia a prospering country enjoying faster economic growth, sustained social stability, and greater harmony among ethnic groups. As an important member of ASEAN and the G20, Indonesia is playing a bigger role in regional and international affairs. I wish to take this opportunity to extend warm congratulations on your remarkable achievements. Both China and Indonesia boast a long and splendid culture. The Borobudur in Yogyakarta and the Great Wall in China are both miracles of ancient Oriental civilizations. Eminent Buddhist monks in ancient China such as Faxian, Huining and Yijing lived and studied in Java and Sumatra. Six hundred years ago, the great Chinese Muslim navigator Zheng He helped build several mosques in places like Jakarta. Today, people in Semarang are still telling stories of how Zheng He, who visited the place during his voyages to the Western Seas, made friends with the local people. In modern times, people of our two nations sympathized with and supported each other during the hard struggles for national independence and forged a strong bond of friendship. As one of the first countries to establish diplomatic relations with the People's Republic of China, Indonesia helped New China break the trade embargo imposed by the West. The Chinese people will never forget those episodes. Entering the new century, our two countries have enjoyed frequent high-level exchanges, deepening political mutual trust and fast growing business cooperation. The establishment of the strategic partnership in 2005 brought our bilateral relations to a new stage. Last year, two-way trade approached 43 billion U.S. dollars, making China one of Indonesia's major trading partners and export markets. In the face of the severe international financial crisis, our two countries worked together to tide over difficulties. We signed a bilateral currency swap agreement worth 100 billion RMB yuan and played a positive role in maintaining regional financial stability. Our two sides have maintained close communication and coordination in international affairs, which has enhanced the influence of developing countries. It is worth mentioning in particular that when major natural disasters truck, peoples of our two countries shared each other's pain and stood together to counter difficulty. For instance, in the wake of the earthquake in Wenchuan, China in 2008, Indonesia sent a medical team to the affected area. An 80-year-old village chief in Aceh traveled more than 2,000 km to deliver donations from his village to the Chinese Embassy in Jakarta. Likewise, when Indonesia was hit by an earthquake and tsunami in 2004, the Chinese international rescue team hastened to the disaster area. This fully shows that China and Indonesia are good neighbors and good brothers. My visit this time is a journey of friendship and cooperation. It is also aimed at planning for the future. Yesterday, I had comprehensive and in-depth talks with President Yudhoyono. We reached important agreement and decided to further strengthen China-Indonesia strategic partnership. The two sides released a joint communique and signed several inter-governmental cooperation documents. President Yudhoyono and I set the new target of raising two-day trade to 80 billion U.S. dollars by 2015. Later today, the two sides will sign economic and trade agreements worth about 10 billion U.S. dollars. The Chinese side announced the decision to provide 1 billion U.S. dollars of preferential export buyer's credit and 8 billion U.S. dollars of credit line to support Indonesia in developing its infrastructure and priority industries. We decided to step up cooperation in mineral resources and clean energy and expand collaboration on maritime research and fishery. Indonesia plays an important role in affairs related to the Malacca Strait. China will enhance coordination with Indonesia and provide support in this regard. The aforementioned projects, agreed amidst the continuing impact of the international financial crisis, are bound to lend strong impetus to our endeavors to sustain the good economic momentum and deepen mutually beneficial cooperation. They will raise our strategic partnership to a new high. Being in Indonesia, I would be remiss if I did not mention the Bandung spirit. On my flight to Jakarta, I could not help but recall that during my visit to Indonesia 16 years ago, I made a special trip to the venues of the Bandung Conference to pay my respects. In 1955, Premier Zhou Enlai, on behalf of the new People's Republic, came to Indonesia in defiance of danger and difficulty, and initiated, together with leaders of other Asian and African countries, the Bandung spirit, a spirit that is still highly relevant today. The Bandung Conference left us a most valuable legacy. Seeking common ground while shelving differences and embracing peaceful coexistence are the core of the Bandung spirit and they remain the guiding principle for handling state-to-state relations today. We must hold dear and carry forward the ever-lasting Bandung spirit. Indonesia, being the largest country in ASEAN, has played a key role at many defining moments in ASEAN's development and made outstanding contribution to a stronger ASEAN through unity. As ASEAN's good partner, China highly commends Indonesia's efforts and rejoices at ASEAN's achievements. All-round East Asian cooperation came into being in the wake of the Asian financial crisis in 1997. Today, in the face of the international financial crisis, China and ASEAN will further strengthen their relations, setting yet another example of mutual assistance and cooperation between developing countries. Under the principles of consensus, responsibility sharing and non-interference, ASEAN has promoted regional political stability, economic growth, and social progress in the ASEAN way. This is in keeping with the trend of peace, development, and cooperation of our time. It is a successful approach with has had an important and positive impact internationally. The ASEAN Charter has set the goal of establishing the ASEAN Political-Security Community, Economic Community and Socio-Cultural Community by 2015. We have every confidence that ASEAN will enjoy greater cohesion, influence and competitiveness and we look forward to the day when the goal becomes a reality. China has all along supported a stronger ASEAN through unity. We highly value and have worked actively to promote our relations with ASEAN. China was the first country to establish the strategic partnership for peace and prosperity with ASEAN and the first big country outside the region to accede to the Treaty of Amity and Cooperation in Southeast Asia. We were also the first country to launch the FTA negotiation with ASEAN, and together, we have put in place the largest FTA among developing countries. All these endeavors accord with the trend of economic globalization and regional integration. They serve the interests of all ASEAN countries and China. At the 7th China-ASEAN summit held in Bali in 2003, I stated China's commitment to a policy of securing an amicable, tranquil and prosperous neighborhood. Eight years on, people can see that China has kept its word. And China will remain committed to this policy no matter what changes may take place in the international landscape. -- China firmly supports ASEAN's leading role in regional cooperation. Over the years, ASEAN has developed its principles and practices of regional cooperation in keeping with the realities of East Asia. These principles and practices have proved effective and mature and should and must be followed. The existing regional cooperation mechanisms in East Asia, including 10+1, 10+3 and the East Asia Summit, should always develop with the "10" or ASEAN in the driver's seat. East Asian cooperation will enjoy sound development only if ASEAN continues to play its leading role. China's position on this issue is steadfast. -- China is committed to deepening practical cooperation with ASEAN. Last year, China became ASEAN's biggest trading partner. We launched the largest FTA among developing countries. And we have set the target of 500 billion U.S. dollars in two-way trade by 2015. The Chinese government will continue to increase imports of competitive products from Southeast Asian countries and encourage Chinese companies to invest in ASEAN countries with a view to expanding our common interests. In the next 10 years, we will speed up the realization of land transport connectivity between China and ASEAN countries and provide financial support to road, rail, communication, electricity and other infrastructure development in ASEAN countries through bilateral aid and loans, the China-ASEAN Investment Cooperation Fund, commercial loans and other means. 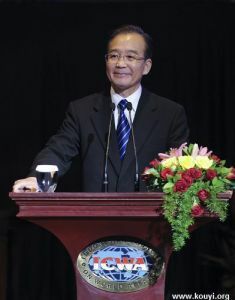 At the same time, we will, in the light of ASEAN's needs, increase input into maritime and air connectivity and take steady steps to promote facilitation and standardization of related areas in a bid to create better conditions for the free flow of goods, capital and information, people-to-people exchanges, and economic and social development in this region. Time will tell that the decision to set up the China-ASEAN FTA is one of strategic vision and will bring greater benefits to the businesses and people of both sides. -- China will actively promote cultural and people-to-people exchanges with ASEAN countries. People play an essential role in enhancing state-to-state relations and interactions between people are instrumental to strong friendship. This year is the Year of China-ASEAN Friendship and Exchange. Over 40 large events have been planned for the year and are being implemented, covering culture, education, tourism, journalism, youth and other areas. Among them, the "Experience China" event has been launched in Indonesia. ASEAN will feature prominently in the Asian Culture Festival to be held in China. The two sides have drawn up the plan to increase the numbers of Chinese students in ASEAN countries and ASEAN students in China to 100,000 respectively by 2020. The spectacular natural beauty and the rich folk culture of China and Southeast Asia are our unique assets for promoting mutual understanding and friendship between our people. At the China-ASEAN Summit last year, a target was announced to have 15 million mutual visits between the two sides by 2015. We need to further tap the potential of cooperation in education and tourism, and encourage more two-way flow of students and tourists so that our traditional friendship will win greater popular support and be passed on from generation to generation. -- China will continue to assist the less developed countries in ASEAN with no conditions attached. Due to historical reasons, some ASEAN members have yet to get rid of poverty. China will, as always, support their development endeavor and do what it can to help them. China's support and assistance are sincere and selfless with no strings attached. As an old Chinese saying goes, "It is better to teach one how to fish than simply give him a fish." China has learned from its own development that to shake off poverty and backwardness once and for all, a country must rely on well-trained professionals and science and technology. The Chinese government will increase input in capacity-building and human resources training to help the less developed ASEAN members gain faster progress towards their development goals. -- China stands ready to work with ASEAN to maintain regional security and stability. History tells us that peace is a blessing while chaos a scourge. There is no denying that there are some disputes over territorial sovereignty and maritime rights and interests in this region. We need to adhere to the principle of good-neighborliness and equal consultation, and work tirelessly for proper solutions to these issues through bilateral channels. China disapproves of any attempt to play up or create tensions and make the issues bigger and more complicated. We are firmly against the use or threat of force. Over the years, China and ASEAN members have made important contributions to maintaining the security of and unfettered access to the international shipping lanes. These contributions have been widely recognized. China will continue to honor its due responsibilities and obligations. China wants to work more closely with ASEAN to tackle such non-traditional security threats as terrorism, transnational crimes, natural disasters and communicable diseases, and foster a peaceful and harmonious social environment. -- China supports efforts to steadily push forward East Asian cooperation and maintain its openness. Openness and transparency are the source of vitality of regional cooperation. East Asian cooperation has always been open and non-exclusive since its very beginning. In recent years, the East Asian region, including ASEAN, has become the most dynamic and fastest-growing region, with rising status and influence on the world economic stage. To involve countries and regions outside the region in East Asian cooperation is a natural choice that conforms to the trend of economic globalization. China welcomes all the proposals that are conducive to regional stability and development, and supports the participation of the United States, Russia, the European Union and other countries and organizations in the East Asian cooperation process. It is important to note that the independence and diversity of East Asia must be respected. And in advancing East Asian cooperation, we should follow a step-by-step approach. We should start with the easier tasks before moving on to the more difficult ones. The priority now is to bring into full play the role of the existing cooperation frameworks, including 10+1, 10+3, and China, Japan and the Republic of Korea, and at the same time explore other cooperation models consistent with the characteristics of the region. Over the past 60 years since the founding of New China, particularly since reform and opening-up, China's economy has grown fast, the Chinese people's livelihood has improved significantly, and China's international standing has risen steadily. Yet China remains a developing country. There is no change of this basic feature about China. Nor is there any change in China's commitment to an independent foreign policy of peace, and to good-neighborliness and cooperation with ASEAN countries. How do we Chinese see ourselves? And how do we view our relations with the world? I want to say we are both confident and clear-headed. We are confident about the development path we have chosen and about our future. We are clear-headed because we know full well the difficulties and risks we face. True, China's economic aggregates are growing year by year, yet when divided by 1.3 billion, they only ranked around 100th in the world. Much remains to be done if China is to meet the goal of building a moderately prosperous society in all respects. We still have a long way to go before we can achieve modernization. Lao Tzu, the Great ancient Chinese thinker, once observed in his well-known work, the Tao Te Ching, "He who knows others is intelligent; He who knows himself is wise." I am now in my ninth year as Chinese Premier. I am heartened by the development and progress of my motherland. Yet at the same time, I often find it difficult to eat or sleep with ease as I have to think long and hard about the ways to counter the various difficulties and challenges facing China. It is true that some regions and some people in China have become rich. But there are still those who have not come out of poverty and face pressing difficulties in education, medical care and social security. We have encountered all the difficulties that many other countries came across in their industrialization and urbanization process. We have even run into challenges that others never experienced. We cannot afford to slacken our efforts in the slightest if we are to live up the people's trust and expectations. We must be receptive to the good experience of other countries. More importantly, we must make bold experiment and exploration in keeping with China's national conditions. To advance national development and meet the needs of the 1.3 billion people represent hefty responsibilities on our shoulders and call for long and arduous efforts. China has no reason whatsoever to be complacent. With a cultural heritage running several thousand years, the Chinese nation values peace and more than anything else. We keep good faith, build amicable ties, and treat others with respect. The ancient Silk Road was used to transport exquisite textiles, tea and porcelain to faraway countries. And Zheng He did not take a single inch of foreign land on his seven voyages to the Western seas. China cannot develop itself in isolation form the world. Nor can the world achieve prosperity without China. The Chinese people cherish their friendship and cooperation with other countries and peoples, and value even more deeply their hard-won independence. I believe this is a shared feeling among people in Southeast Asia and in China. China's development will not stand in the way of any country, nor will it ever pose a threat to any country. China is firmly committed to an independent foreign policy of peace and will always pursue peaceful development for generations to come. As an Indonesian proverb reads, "jauh di mata, dekat di hati (Though living far, it is close to my heart)." The Chinese people cherish beautiful impression of indonesia. They are enchanted by its unique island landscape, diverse culture, and exotic atmosphere. Half a century ago, China, Indonesia and many other newly independent Asian countries came onto the international political stage, announcing the birth of an new Asia. Today, we are witnessing the all-round rise of Asia and a great rejuvenation of the Oriental Civilization. The dream of our forefathers for a thriving Asia is coming true in our time. And China and Indonesia are important force driving in this epoch-making change. Similar historical experiences brought us together, and a shared historical mission will link us even more closely. Let us join hands to strengthen our good-neighborly relationship, deepen comprehensive cooperation, create a bright future, and usher in an Asian century. Processed in 0.029010 second(s), 16 queries.